Thomas Long has impacted generations of students through his teaching and scholarship. If you had to describe Thomas G. Long’s career in two words, "grand slam" would be a good choice. The baseball metaphor is appropriate for the Atlanta native and passionate Braves fan who is also a widely respected preacher, professor, author and mentor. 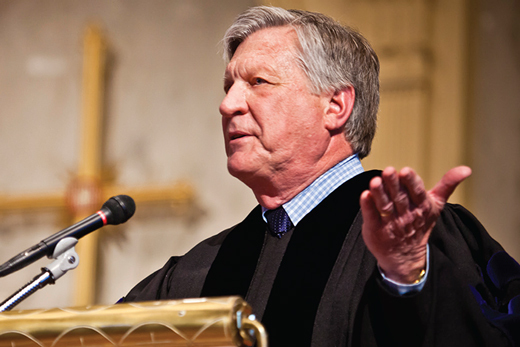 Long, who is retiring as Candler School of Theology’s Bandy Professor of Preaching, arrived at Emory in 2000 after an already distinguished career in academia, religious publishing and the church. Long "does more than simply teach students; he prepares them for growth in ministry with helpful, critical feedback, and a spirit of encouragement, which creates stronger preachers and leaders," one student wrote when the current senior class recently honored Long with the "On Eagle’s Wings" Excellence in Teaching Award. That’s just one of the many reasons why Long has been chosen as this year’s recipient of Emory’s Scholar/Teacher Award. The award is given on behalf of the United Methodist Church Board of Higher Education and Ministry to an Emory faculty member who has demonstrated exceptional teaching, concern for students and colleagues, and made significant contributions to the scholarly life of the university. "He is widely regarded as the pre-eminent figure in this field, and his citizenship as a member of the faculty has been exemplary. . . . He is a recognized leader in every respect, who, at the same time, is always willing to serve the collective," Candler Dean Jan Love noted in a letter nominating Long for the award. "For these reasons, he is a model of what it means to be a scholar/teacher." For Long, teaching is the heart of his vocation. "The student is the whole object for a teacher," he says. "A teacher who doesn’t keep the students in view is missing the objective." Long’s former students laud his encouraging spirit and ability to coach developing preachers. "He sees gifts in people that you never saw in yourself," says Daniel Ogle 08T, now an ordained United Methodist pastor, who also served as Long’s teaching assistant during his student days. "He has this unique gift and calling to help people see the gifts that God has given them for ministry even if they can’t see it in themselves." This speaks to one of the biggest changes that Long, who is also an ordained minister in the Presbyterian Church (USA), has witnessed in his four decades of teaching. "There’s a different student out there now," he explains. "Forty years ago, you could assume that everyone in the class wanted to preach and preach well." Now, "some of them are quite tentative about a call to ministry, and are there in an exploratory mode," Long explains. "I have to teach across a broader waterfront." To assist students who are discerning their callings, Long puts more emphasis on the theological focus of preaching. Some students will become church leaders, while others will use their gifts in chaplaincy roles, in nonprofits and in community development. And some, like Kimberly Wagner 09T, may become professors themselves. Wagner, who is working on her PhD in homiletics in Emory’s Graduate Division of Religion, will be Long’s last doctoral advisee. "In his always quiet steady way, he just kept approaching me," she recalls. "He said, ‘Have you thought about teaching? Have you thought about preaching?’ He gets in your head, but in the best possible way." Ted A. Smith, associate professor of preaching and ethics, joined the Candler faculty in 2012, but has known Long for decades, starting when he was an undergraduate. He also took two of Long’s courses at Princeton Seminary. Although Smith had significant preaching experience prior to seminary, his first course under Long changed the way he preached. "My whole preaching style, which I still carry with me, came out of that class," he says. Smith later served as Long’s teaching assistant, and today calls him a colleague and friend. He also appreciates Long’s gift for writing and his prolific body of work. "Tom’s ability to combine writing for the academy and writing for a broader public is truly remarkable," Smith says. "The thinking is original and insightful, and it’s informed by a huge body of research." Long’s 1989 book, "The Witness of Preaching," is one of the most widely used texts on preaching, appearing on class reading lists in seminaries throughout the world. In 1996, Baylor University named him among the 12 most effective preachers in the English-speaking world. In 2010, "Preaching" magazine named "The Witness of Preaching" one of the 25 most influential books in preaching for the last 25 years. While Long is officially retiring, he isn’t giving up working at Candler. For the next five years, he will direct a new Candler initiative, made possible by a grant from the Lilly Endowment, aimed at helping recent alumni become leaders in their communities. He also has a full slate of dates to preach and teach, including serving as a visiting professor at Yale University next spring. And, of course, there will be lots of Braves baseball. Some things don’t change.